Special Food Edition, Part 2 | Comics I Don't Understand - This site is now being updated daily at http://www.comicsidontunderstand.com. Please change your bookmark if necessary, and notify any web site with a link to the old address. Maybe it’s…a pun on “magpie”? Is that funny? I guess it’s funny for this particular strip. I would guess it’s about magpie. Clearly, these people live in the Bizarro world, where random pie is a fact of life. Actually, I wonder if Yard Pie is made with Road Apples? 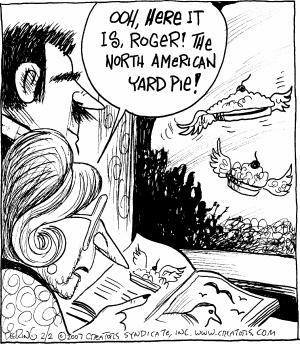 I thought it was a take on “yard bird”, which I think is slang for chickens. None of you know the song “American Pie”? So four and twenty blackbirds were baked in a pie and somehow cross bred?